The 4-8-2 was most popular on the North American continent, where Pacifics were becoming over-burdened as passenger trains grew in length and weight. The first North American 4-8-2 locomotives were built by ALCO for the Chesapeake and Ohio Railroad in 1911. ALCO combined the traction of the eight-drivered 2-8-2 "Mikado" with the excellent tracking qualities of the Pacific's four-wheel leading truck. Although the C&O intended their new Mountains for passenger service, the type proved ideal for the new, faster freight service the railroads were introducing. Many 4-8-2s were built for dual service. Mountain type locomotives were built for 41 American railroads; approximately 2200 were built. The largest users were the New York Central Railroad with 435 of what they named the Mohawk type (the Water Level Route had no need for "Mountains", after all! ); the Pennsylvania Railroad with 224 class M1 and M1a locomotives, used mostly for fast freight service; the Florida East Coast with 90 passenger locomotives; the New Haven with 70; and the Southern Railway with 58. 50 L-4 locomotives were produced by the Lima Locomotive Works in 1943. None of them had booster engines, although they were built to take them should they be ever needed in a dash;they weren't. The L-4s were truly dual purpose locomotives, and worked the heaviest freight and passenger trains during the war. 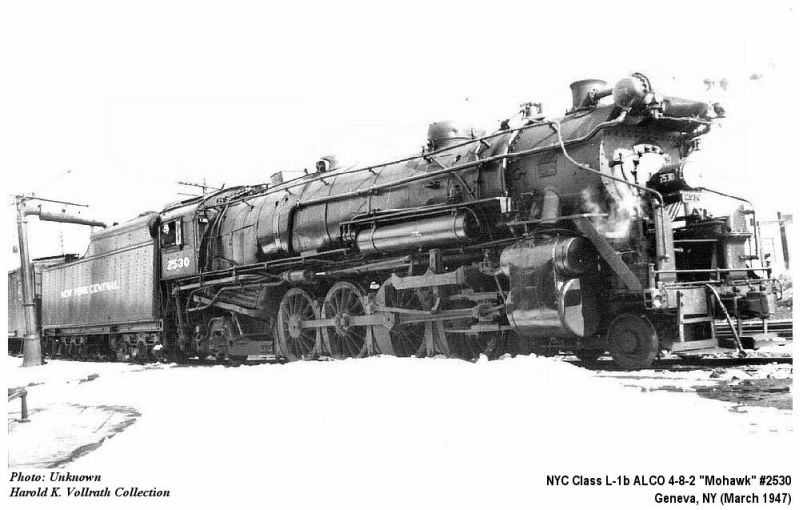 The L-3 and L-4 classes had huge tenders riding on two six-wheel trucks that were almost as long as the locomotives hauling them, and were mostly coal space, a capacity for 43 tons of the stuff; water was taken en route using the tender scoop from track pans and thus the locomotives did not need to have that great an on-board water capacity. Many L-4 locomotives were fitted with smoke deflectors later on.